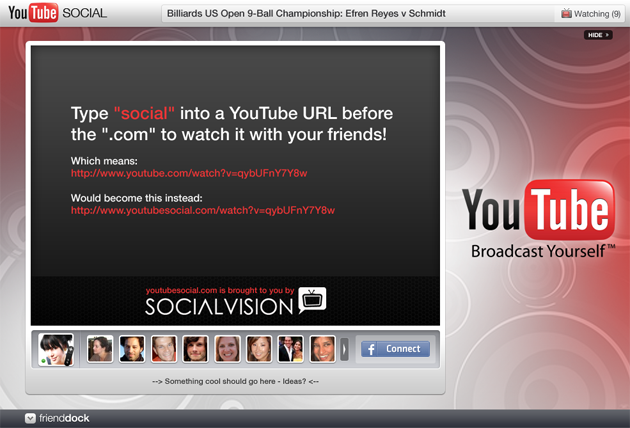 I/O accelerator company SocialVision, purveyors of white-label “Viewing Party” software today launch YouTubeSocial as their first consumer facing product. 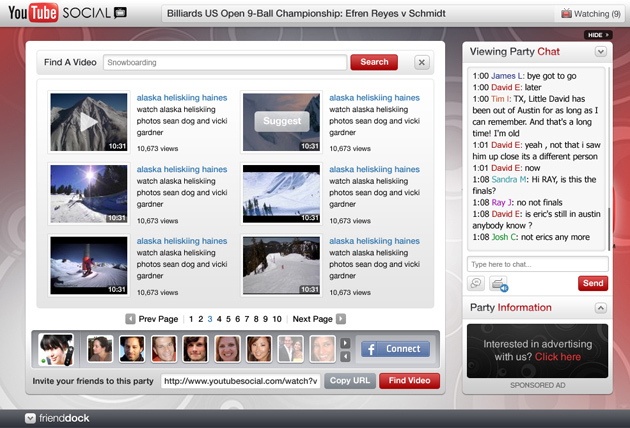 Similar to Clipsync, YouTubeSocial combines Facebook’s Social Graph with IM-like chatting capabilities and people’s insatiable desire to view video content online, making it easy for users to hold what founder David Sanghera calls “Viewing Parties” which is a fancy name for being able to watch video with your friends simultaneously in realtime. As homegrown YouTube videos like this one,are one of the most oft shared online mediums, it seems natural to build a platform specifically for sharing them, as opposed to defacto ways we share them now i.e. through email, Twitter and YouTube itself. And there are multiple ways to interact with YouTubeSocial, the easiest way is to take any video from YouTube, type “social” in the URL and it will automatically redirect you to the YouTubeSocial platform. 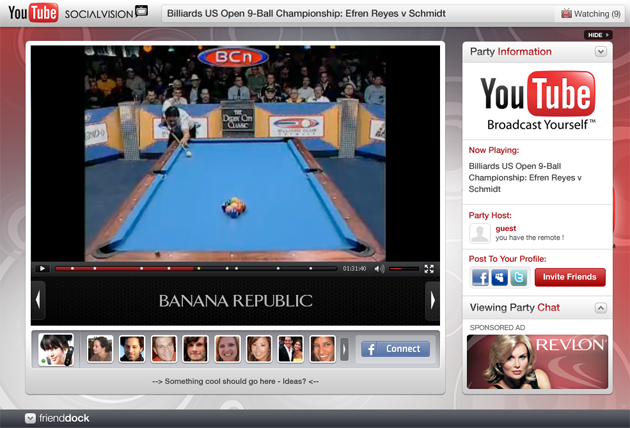 Once you can either copy a URL to invite your friends to the video or use the Facebook Connect integration, which will populate your friend’s dock where you can drag and drop friends into the “Viewing Party,” Facebook automatically sending them a chat message that they’ve been invited. Founded by Sanghera, Karthik Kailash, Ravi Dharawat and Monish Subherwal, YouTubeSocial is currently only integrated with the Facebook platform but might move on to mySpace and IM integration if things go well after today’s launch. Larger implications of the “Viewing Party” “synergy between content partners, advertisers, and viewers”model is that eventually content providers like AMC, Direct TV or Fox can hold advertiser sponsored viewings off their own platforms.